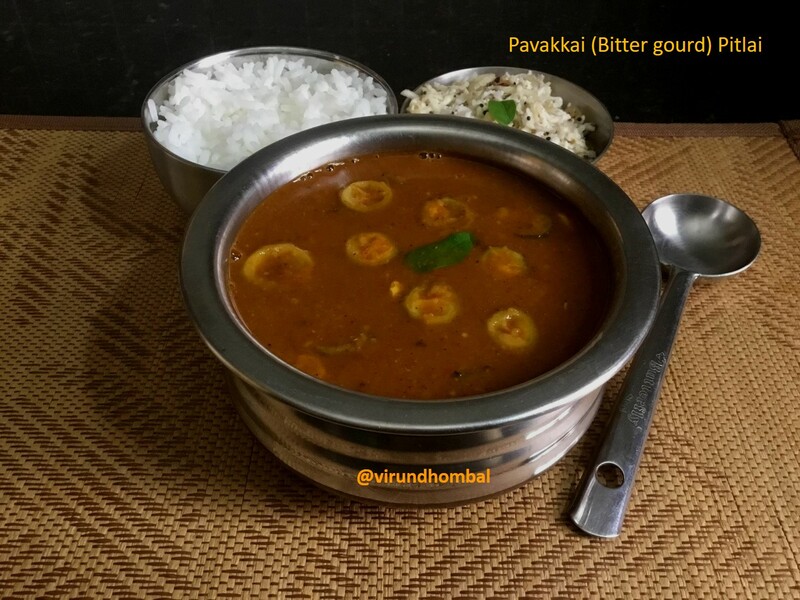 Bitter Gourd Pitlai - an easy South Indian kuzhambu made with bitter gourds, toor dal flavoured with a good amount of red chillies, coriander seeds, chana dal, coconut and other spices. I guarantee this kuzhambu will surely impress your family. We always prefer kuzhambu with a good aroma and perfect balance of heat with a hint of tanginess. 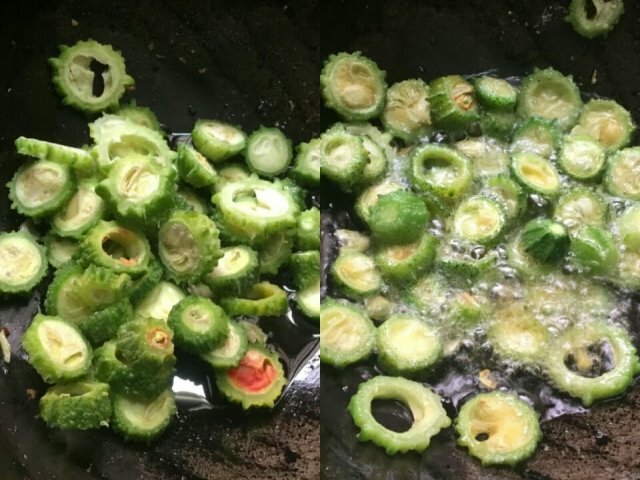 Wash the bitter gourds and cut them into small circles. Soak the tamarind in hot water for 20 minutes. 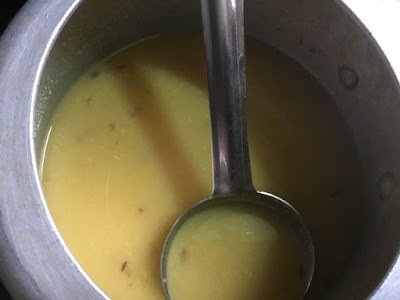 Soak the toor dal for 20 minutes. After 20 minutes, pressure cook the toor dal for 4 to 6 whistles. Extract the tamarind pulp with 2 cups of water. 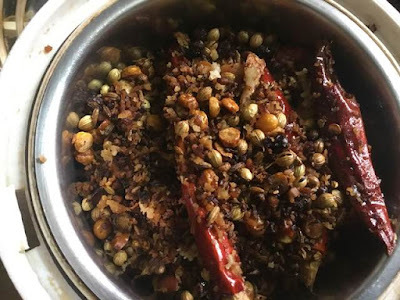 Heat a tsp of oil in a frying pan and add the chana dal and coriander seeds. Roast them well on medium heat and after a few minutes add the black pepper and cumins. Next, add the red chillies and roast it. After a few minutes, add the grated coconut and fry them well until it turns golden brown. Allow them to cool down completely.Add these roasted spices in a small chutney jar and grind it smoothly. Heat oil in a frying pan and add the bitter gourds. Saute them on medium heat for a few minutes. 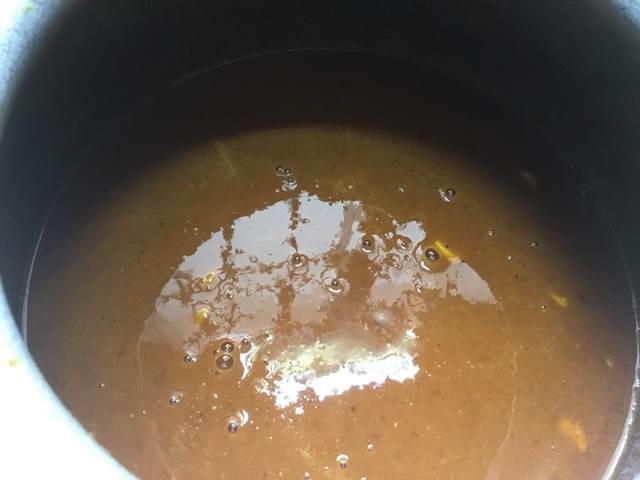 Next, add the bitter gourds to the tamarind extract. Add the required salt and turmeric powder. Keep on medium heat and cook the bitter gourds well in the tamarind extract for 15 minutes. 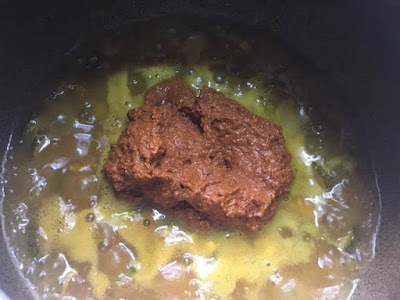 Now, add the ground paste along with 1 cup of water. Mix them well without any lumps. After 5 minutes, add the cooked toor dal and mix them well. Allow the kuzhambu to boil for 10 minutes on medium heat. 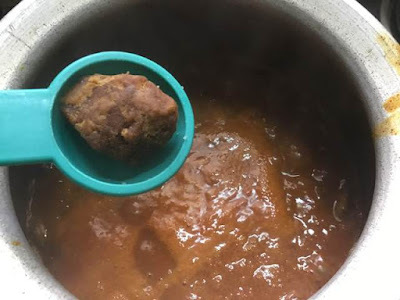 When the kuzhambu has boiled well, add the jaggery. After 5 minutes, turn off the heat. Heat oil in a small frying pan and add the mustard and urid dal. 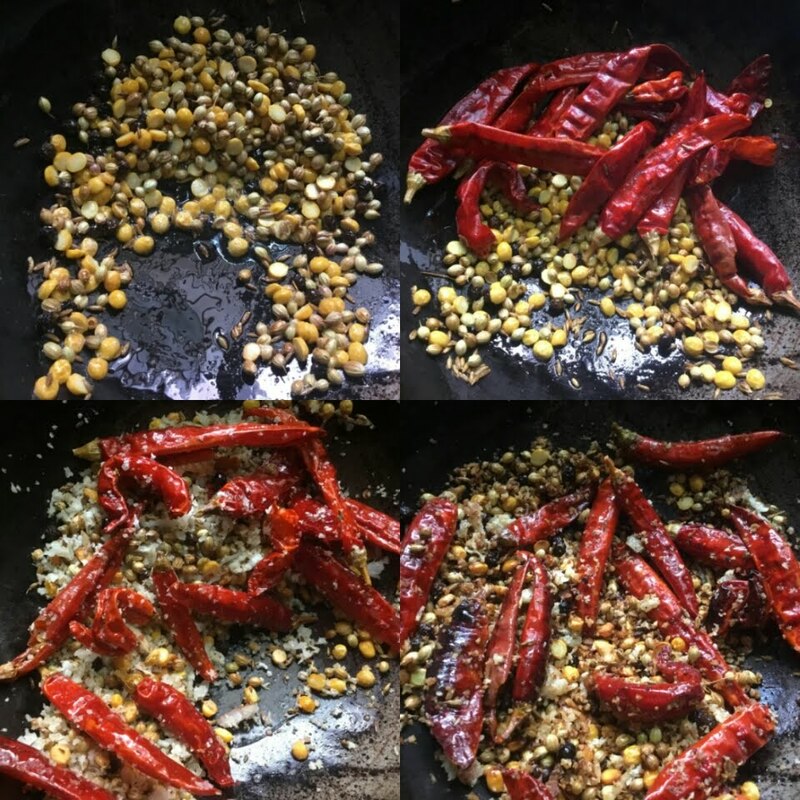 When it splutters, add the curry leaves and add it to the hot kuzhambu. Wash the bitter gourds and cut them into small circles. Soak the tamarind in hot water for 20 minutes. Soak the toor dal for 20 minutes. After 20 minutes, pressure cook the toor dal for 4 to 6 whistles. Measure and keep all the ingredients ready for roasting the spices. 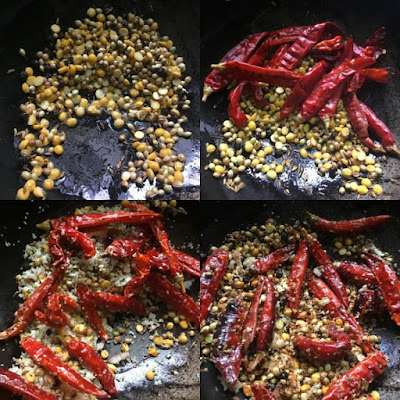 Heat a tsp of oil in a frying pan and add the chana dal and coriander seeds. Roast them well on medium heat and after a few minutes add the black pepper and cumins. Next add the red chillies and roast it. After a few minutes, add the grated coconut and fry them well until it turns golden brown. Allow them to cool down completely. 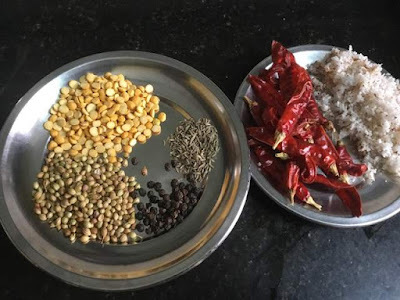 Add these roasted spices in a small chutney jar and grind it. Grind as shown in the picture below. 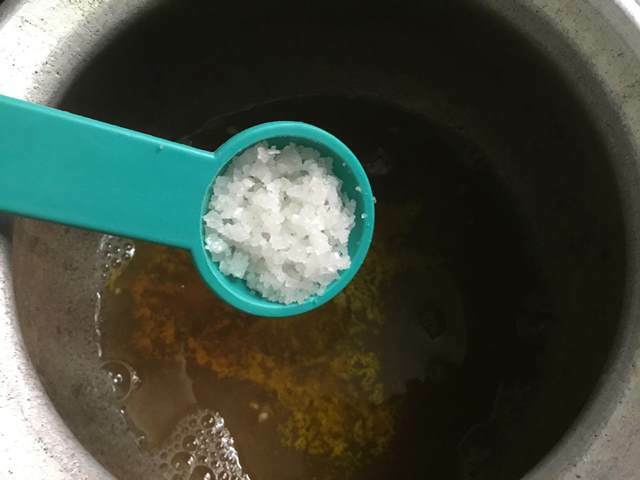 Add water at regular intervals and grind it smoothly. 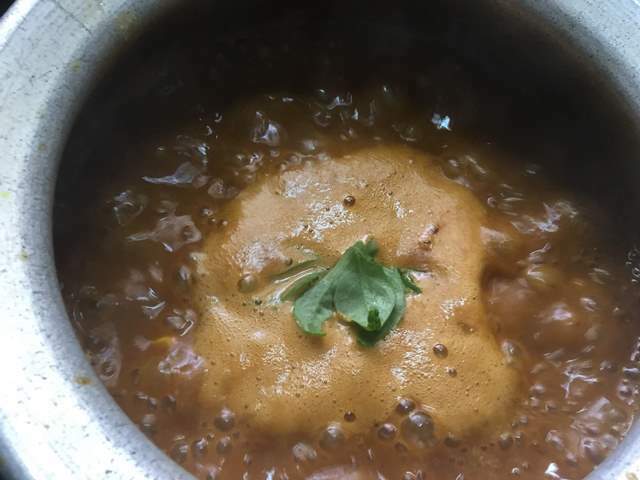 Open the pressure cooker and mash the dal with a ladle. 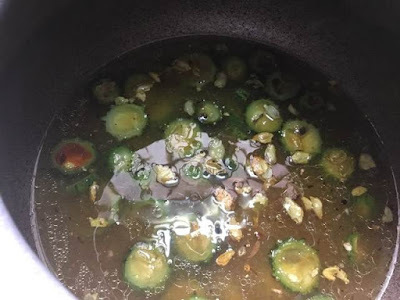 Heat oil in a frying pan and add the bitter gourds. Saute them on medium heat for few minutes. 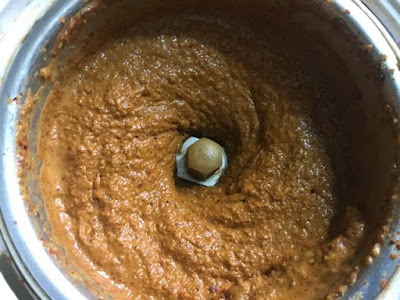 Now, add the ground paste along with 1 cup of water. Mix them well without any lumps. After 5 minutes, add the cooked toor dal and mix them well. Allow the kuzhambu to boil for 10 minutes on medium heat. When the kuzhambu has boiled well, add the jaggery. After 5 minutes, turn off the heat. Heat oil in a small frying pan and add the mustard and urid dal. 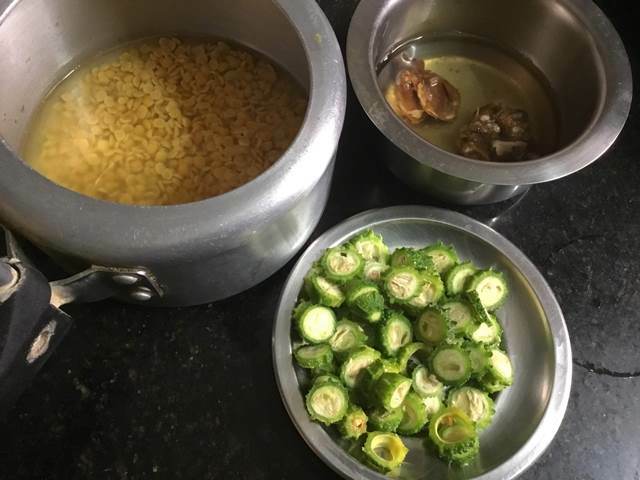 When it splutters, add the curry leaves and add it to the hot kuzhambu.